Welcome to "Zi;BOX", the newest climbing / bouldering gym in Tohoku! Mr Kurimura, the manager, speaks a little English. Zi;BOX is in the eastern area of Sendai near route 4 by-pass/Higashi Sendai motorway junction.It's a few hundred metres north of Shichigou Junior High School. 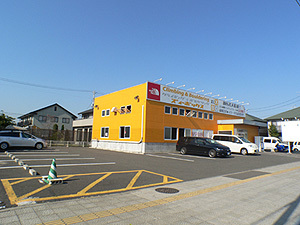 [BY CAR]　It takes about 20 minutes from Sendai city centre.We have parking place for visitors. [BY BIKE]　It takes s about 30 minutes from Sendai city centre. [BY BUS]　Catch the Sendai city bus going to Fukanumakaigan. Get off at Arai and walk for 1 minute. [BY TRAIN]　By train it's 3km from Fukudamachi station on the Senseki line. 2 times a month (check website for when) it's "Lucky Day". Visitor students pay ￥1,050, Visitor Adults pay ￥1,050. Free rental shoes and chalk..
[3HOUR USE]　Climb when you want for as long as you like. Students ￥1,296, Adults ￥1,620. 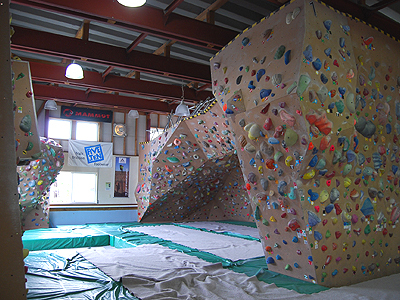 [LADIES DAY]　On the 5th, 15th and 25th of every month it’s only ￥756 for unlimited climbing. Free rental shoes and chalk..
1 month. Students ￥6,480. Adults ￥8,640. 6 months. Students ￥34,560. Adults ￥39,960. 1 year. Students ￥61,236. Adults ￥75,600. [LUCKY7 PASS]　7 times pass. Students ￥7,992. Adults ￥10,800. WE LOVE HAVING YOU HERE!! Copyright© 2008 Zi;box Co.,LTD All Right Reserved.